Check out some initiatives we have undertaken to make our Earth a greener place. In an effort to help keep our planet green we offer recycling bins at each of our 7 cafe locations and encourage our customers to recycle Olivers cups and lids. Please be kind to our planet. We give away used grounds for your garden absolutely free of charge – Just ask one of our lovely baristas! The same coffee that went into your delicious beverage want to infuse your garden with nutrients, just ask for a free bucket next time you are at one of our 7 locations. To reduce paper cups we offer a 10 cent discount when customers use their travel mugs to fill up with a beverage of their choice. 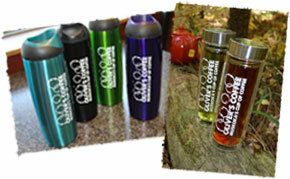 Save money & help protect our environment by using your travel mug each time you purchase a drink from Olivers. don’t have a travel mug? You can purchase one of our cool travel mugs for $20 at a location nearest you. Choose from black, purple, turqoise or green. Choose one of our trendy new Glass Tea Diffusers for $20. Plus receive a FREE coffee card with any travel mug.